Many people find used saddles for sale at flea markets, tack stores, garage sales or in classified ads, and need to identify the type of saddle they have. The first step is to get a general sense of the overall type of saddle, followed by identifying the saddle maker. Many popular saddle makers have websites or catalogs, and you can look up more information about the saddle online or in books to find out how many were made, when it was produced, and in what styles and colors. First, determine whether you have an English or a Western style saddle. English saddles are flatter and have less padding than the Western, or cowboy-type saddle. Western saddles have a saddle horn, a protrusion on the pommel or front of the saddle that is used in ranch work. 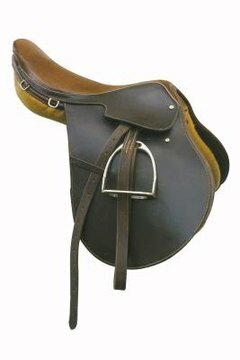 English saddles always have a single girth with either two or three straps to attach the girth, while Western saddles may have one or two girths. The maker's mark on an English saddle usually is stamped into the leather under the leg flap. Place the saddle on a stand or a fence post so you can look at it carefully. You may want to have a magnifying glass handy if the saddle is very worn so you can see the marks better. Lift the flaps up, first on the left side and then on the right. Look under the flap for the name, country of origin, and any identifying serial number. These often are stamped on the sweat panel or under the leg flap near the girth straps. Common saddle brands are Crosby, Kieffer, and Steuben, but there are many others. Western saddle makers typically place their marks on one of three places: the latigo holder, behind the cantle or on the fenders. A few makers stamp underneath the flap or on the seat itself. Sometimes you can find the maker's mark on a metal tag placed on the saddle. Popular Western saddle makers include Billy Cook, Circle Y, Tex Tan and Tucker. Once you have determined whether or not you have an English or Western saddle, and found the maker's mark and serial number or other identification number, it's time to learn more about your saddle. First, do an online search and find out whether the saddle still is being made. If it is, you can find information about it easily on the company's website or on a tack store website. If it's an older saddle, many saddle repair shops offer information on popular saddle makers and saddle types. Jeanne Grunert has been a writer since 1990. Covering business, marketing, gardening and health topics, her work has appeared in the "Chicken Soup for the Soul" books, "Horse Illustrated" and many national publications. Grunert earned her Master of Arts in writing from Queens College and a Master of Science in direct and interactive marketing from New York University. Which Way Should a Rein Buckle Point? What Kind of Cinch Do You Use for a Rear Flank Strap?